Is there any sight more heart-warming, more guaranteed go make you go “Awww!” than a newborn foal nuzzling up to its Mother? No matter how many times you’ve seen it, it never fails to be a miracle. It’s almost that time of year again, despite the snow you might see out your window. Foaling season is on our mind this morning, as we’ve read that the Bureau of Land Management has agreed to delay some of their annual wild horse herd roundups until after foaling season. Wild horse roundups are controversial in and of themselves: some people say they’re essential for herd control and health, while others say they’re dangerous and inhumane. What isn’t open to debate is the sheer magnificence of seeing a new foal: the filly’s wobbly legs and flickering tail as she teeters upright, delicate and determined at the same time as she seeks out her mother’s milk — or the unbounded exuberance of a colt who’s just discovered he can do more than stand, he can walk — and then he can do more than walk, he can run — and maybe, just maybe, if he could get these tiny hooves off the ground long enough, he might just be able to fly. Wouldn’t you be able to capture that energy and joy in your heart? You can do the next best thing and wear it close to yours! This pendant is a particular favorite of ours. 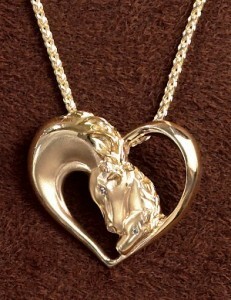 Rendered in 14K gold, with diamond eyes and exquisite detailing, this mare and foal pendant is the perfect piece for so many looks: the ideal accent for a romantic look, sporty enough to wear as an everyday piece — perhaps a signature piece! Also an ideal gift, especially for a new mother — or from a child to their mother! Love transcends all, no matter what species we are. Horses, in this instance, just say it best.